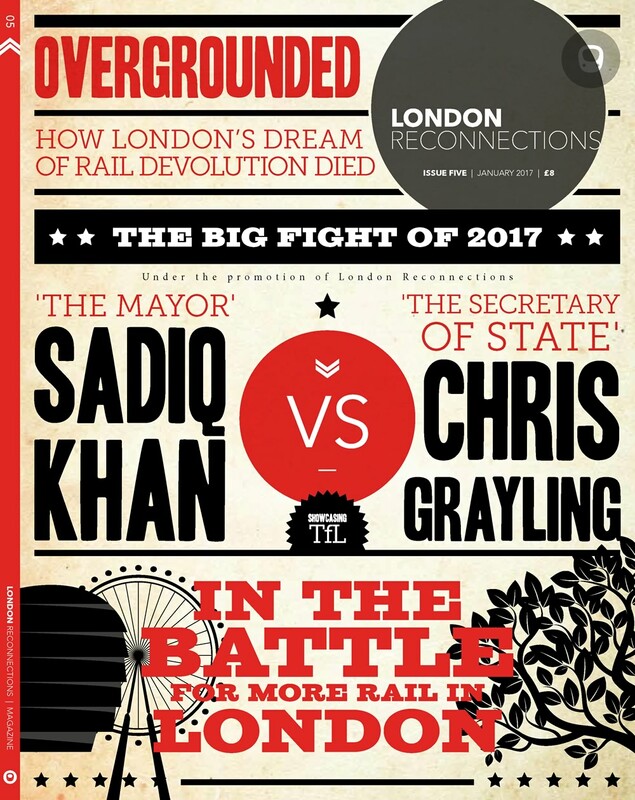 If New York and London are twinned as cities, then it is only a small leap to think of the London Underground and the New York Subway as sister networks. They may differ in many ways, but they are both ultimately large Underground networks of historic standing, and over the years there have been many exchanges of both staff and knowledge between TfL and New York’s MTA. With this relationship in mind, the damage that the recent “frankenstorm” inflicted on the New York Subway system will have been uncomfortable watching to anyone familiar with the way metro systems work. Of all the dangers to such systems that freak natural disasters can pose, it is arguably flood that presents the greatest potential for wholesale damage. 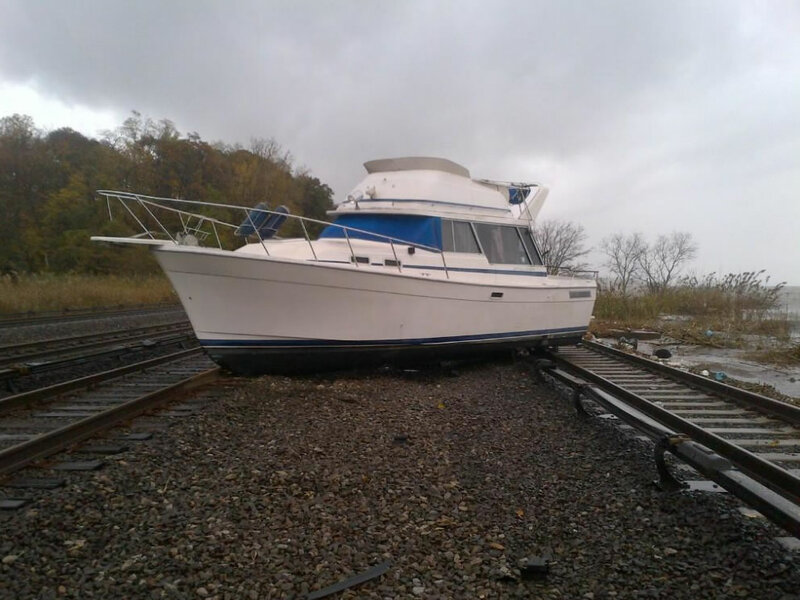 New York was warned, and the MTA had moved trains to high ground and put in flood protection where it could, but it was not enough. 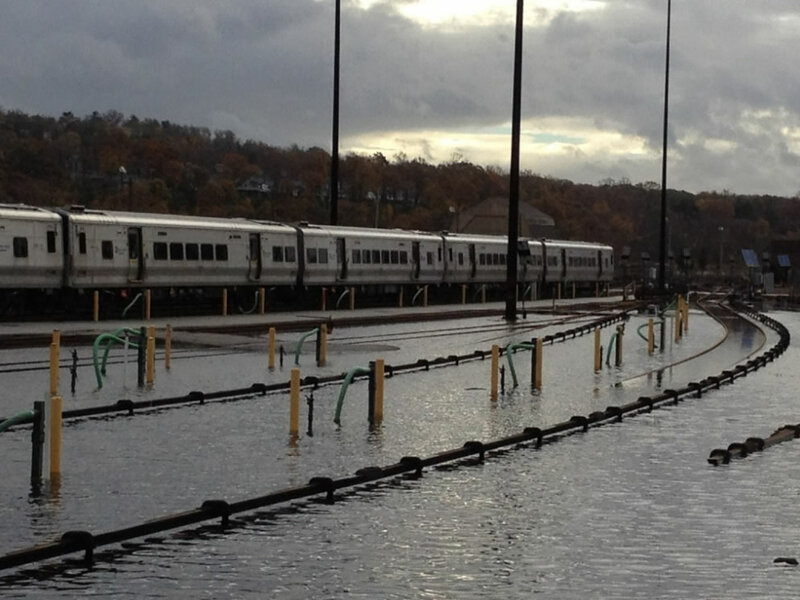 Holding back the water at West Side Yard, via the MTA. With surface lines blocked by fallen trees and debris, power lines down, and the Subway’s tunnels beneath the East River flooded. There is no-one who will argue with him. Beyond the serious damage to track and operating infrastructure, comes the damage to stations themselves. 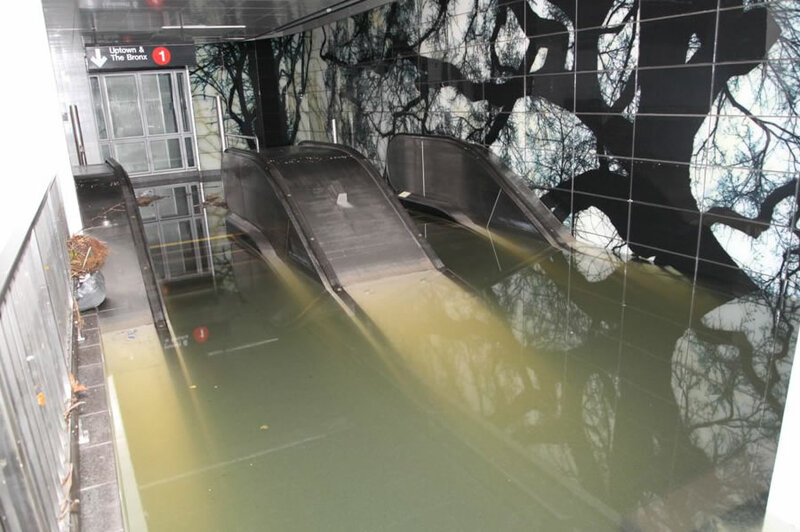 The images of stations underwater that began to surface as the storm progressed, and the video footage that the MTA themselves have released since highlight the enormity of the task that faces the MTA and its railwaymen and women as they struggle in the coming weeks to return their lines to service. As the Subway’s workers and commuters begin their quest to return to normality, London’s own railway workers and commuters will no doubt be look on with empathy and understanding. As the London’s media watches from a distance, it seems almost inevitable that someone will look to the City and ask “could it happen here?” There are key differences between New York’s relationship with its rivers and the Atlantic, and London’s relationship with the Thames and the North Sea, but it is a fair question nonetheless. This thus seems a good opportunity for us to turn to the subject, and look briefly at the Underground’s own uneasy relationship with water. The role that the River Thames has played in the history and development of London needs no repeating here. As an artery for trade, and as a permanent divider between north and south, the Thames casts an inescapable shadow over London. Yet for the early Underground, confined as it was to north of the river Thames, it was surface water, not fluvial flooding, that presented the greatest risk. Sudden, heavy rain was the greatest cause of unexpected flooding. It is a problem that remains today, as any reading of the various flood plans and assessments put together by London’s various local government bodies and oversight groups makes abundantly clear. In both the GLA’s 2009 Flood Risk Assessment and the City of London’s Flood Risk Assessment, it is clear that it is rain that concerns London Underground more than any risk from the river. This may seem a strange stance to take. 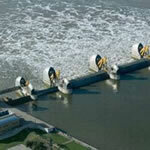 Common sense would seem to dictate that the fast flowing tidal Thames would be worth keeping a careful eye on. The Thames is crossed, beneath its surface, 9 times in total by 5 lines (the Jubilee 4 times, Northern twice, Bakerloo, Victoria and Waterloo & City once each). That’s a total of 18 tunnels taking trains, plus the two disused City & South London tunnels to King William Street. Indeed if the Overground is included, another tunnel can be added as the East London Line uses Brunel’s original Thames Tunnel to pass beneath the river. As the the first ever tunnel successfully constructed beneath a tidal river, and one that flooded a number of times during construction costing a number of lives (and almost that of Isambard Kingdom Brunel himself), the Thames Tunnel would seem to be the ultimate warning that the River Thames is not to be trifled with. The truth, however, is that tunnels, once built, have little to fear from the mere proximity of a river itself. 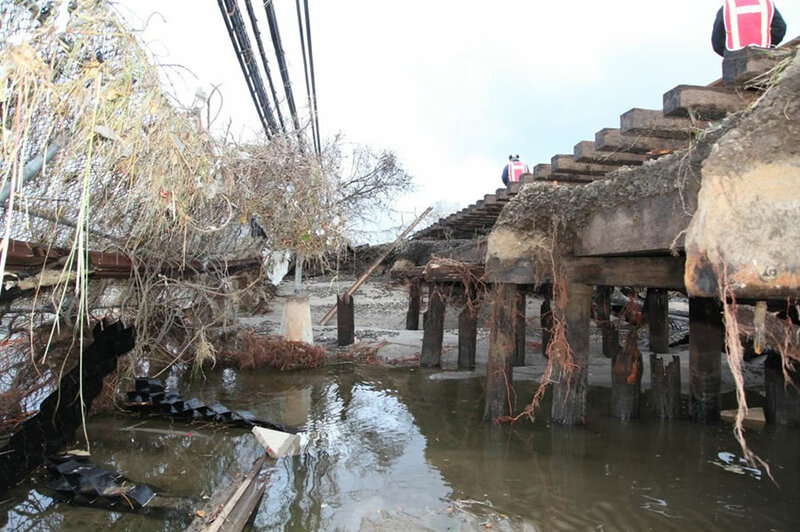 As New York discovered to its cost, it is tides and tidal flooding that pose the greatest risk. Water entering the lowest lying areas of the Tube network via tunnel portals and stations, not breaks within the tunnels as they pass beneath the river bed, are the real danger. In this regard, London found itself geographically blessed. Whilst the Thames is tidal, it stops being so at Teddington. On top of this, historically it has never proven particularly liable to flooding. Between the construction of the Bakerloo and Northern Lines, the two lines most likely to be susceptible to fluvial flooding, and the Second World War, only the Thames Flood of 1928 (which caused 14 deaths) overtopped the Embankment and caused serious damage. Afterwards the great North Sea flood of 1953, for all the devastation it caused, failed (albeit by mere inches) to top the Embankment. 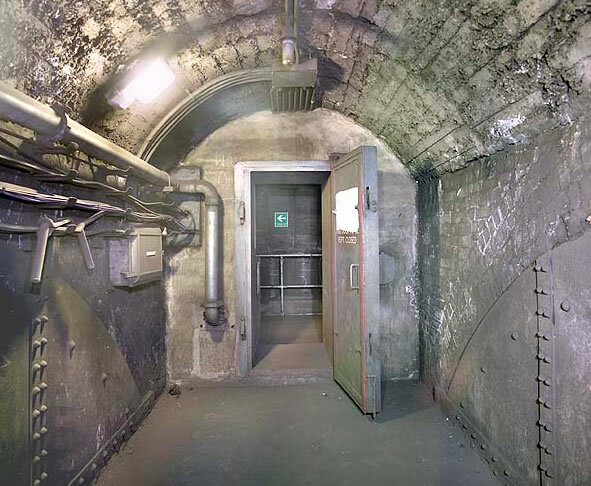 On top of this, by the end of the Second World War, the Underground had gained an additional level of protection – floodgates. In 1938, with war looming, it had become clear that, for the duration of the coming conflict at least, it was bombs – not tides – that would be the likeliest cause of flooding. With that in mind, it was decided that the danger of a bomb breaking open the sections of the Bakerloo and Northern line tunnels beneath the river needed to be addressed. On the advice of William Halcrow, a “quick fix” was put in place. Underground services were curtailed and limited to north of the Thames, and the tunnels were blocked off with concrete plugs. 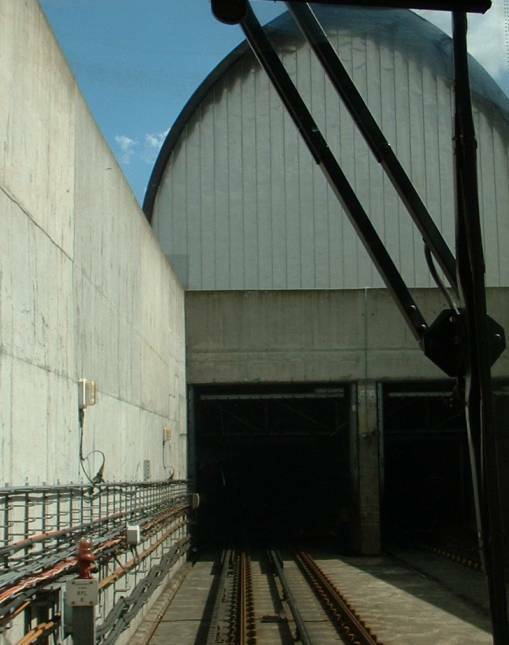 This was not, however, a long term solution and so a more flexible system for closing off the tunnels was put in place. This consisted of a series of heavy steel floodgates, put in place at key points between September and December 1939. Upwards of 30cm thick, and weighing about 6 tons, these could be slid into place either electronically or manually when an air-raid began. This was not a new idea – indeed the same thing had been mooted in World War One as the risk of air attack began to emerge – but it was certainly effective. 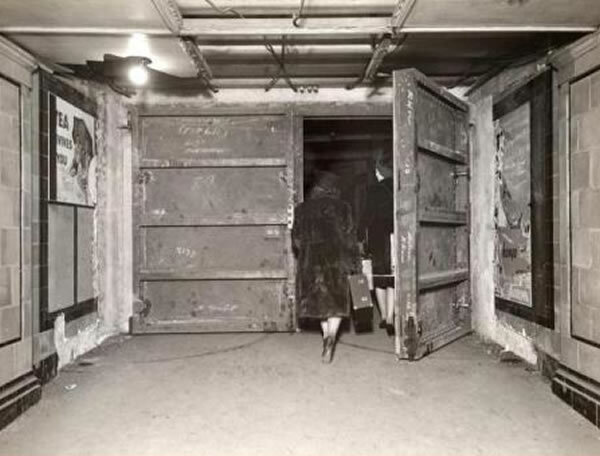 It meant (with one key exception) that the concrete plugs could be removed and normal service patterns resumed, but also that upon commencement of an air raid, the tunnels could still quickly and effectively sealed. The key exception to this was the old Northern Line loop which had already fallen into disuse. 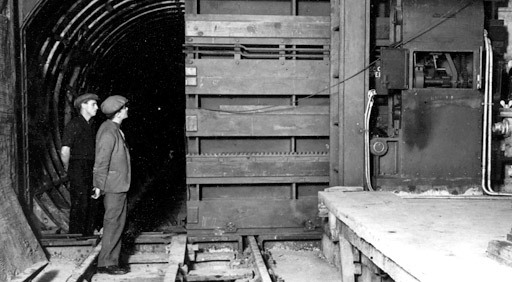 Here Halcrow’s original concrete plug was left in place, which turned out to be very fortunate indeed – the loop was the only section of sub-Thames tunnel that would be pierced by bombs and flooded during the War. Luckily Halcrow’s plug held long enough for the breach to be found and sealed, and a major flood was avoided. For those interested, an excellent overview of the loop and its flooding can be found on Ianvisits website. Sadly, the network did not escape flooding completely. As became abundantly clear, wherever stations or tunnels passed beneath major water pipes or sewers, they were also vulnerable to flooding. This became tragically clear on October 14th 1940, when Balham Station suffered a direct hit. 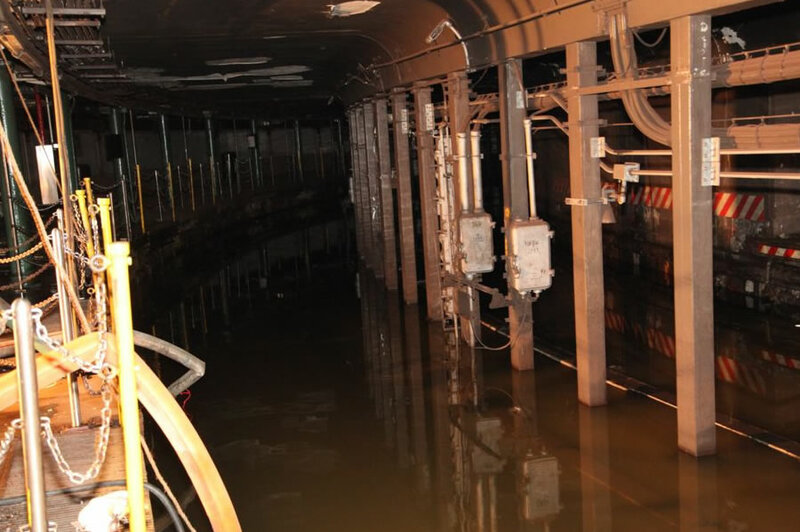 The north-bound tunnel partially collapsed and water mains and sewer pipes above the station were ripped open, sending earth and water flooding into the station tunnels. 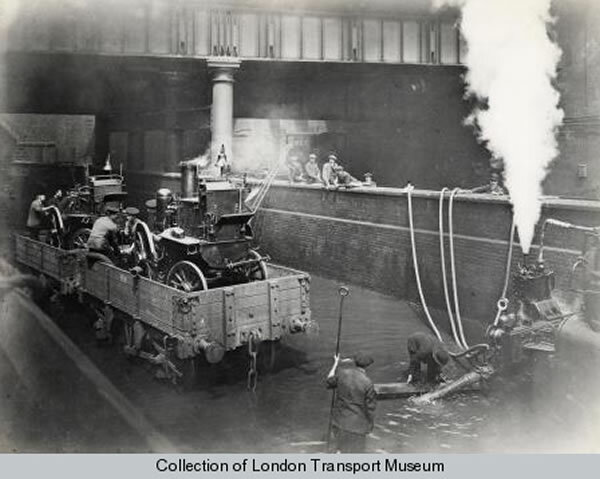 With no floodgates in place, the water poured through the connecting passages into the southbound tunnel as well and flooded the tunnels almost as far as Clapham South. Over 65 people were killed. By the end of the War, floodgates were in place at all the key points on the network where flooding from either the river or from utility or sewage pipes was a major risk. Amongst others, South Kensington, Embankment, Charing Cross, Waterloo, London Road, London Bridge, Wapping, Bethnal Green and Bank all had floodgates and in some locations – such as at the top of the Piccadilly Line escalators at Holborn – these gates remain visible today. 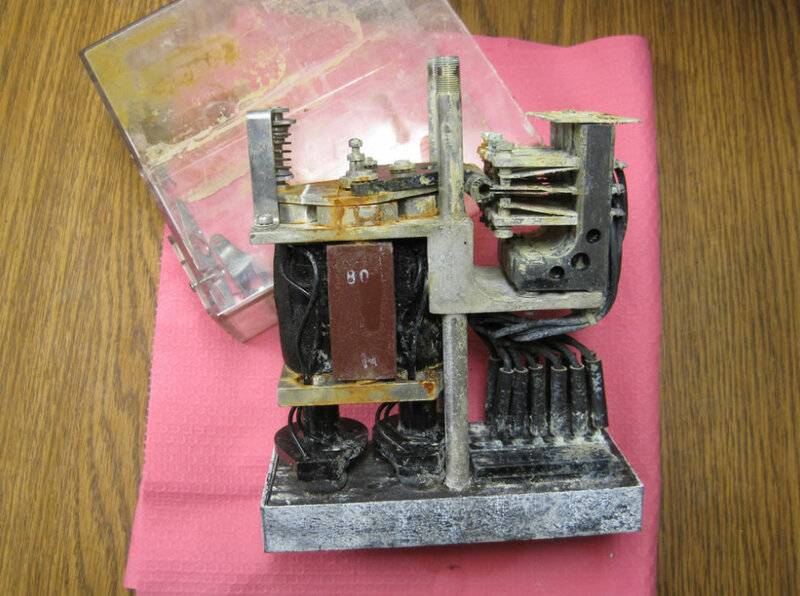 As the Cold War developed, and the fear of bombardment switched from the standard munitions of Germany to the atomic munitions of Russia, a second wave of floodgate installation followed. Tottenham Court Road, Kennington, Moorgate, Liverpool Street, Green Park and Russell Square all gained floodgates in the 1950s, as further protection against ruptured waterworks was added. A new cross-over juntion was also added at Kings Cross on the Piccadilly to allow the line to operate between there and Cockfosters should the Russell Square gate ever need to be closed. At the same time, a plan was put in place to create a control centre from which the Tube could be kept running as long as possible in the case of an atomic bomb attack, and from which the floodgates could be remotely operated if needs be. The location chosen for this so-called “Special Works” project was the never-finished North End station on the Northern Line. Work had started on the station fifty years before but no sooner had the lift shafts been sunk and various sub-surface spaces excavated when Hampstead Heath was expanded around the site, rendering its existence unnecessary. Construction stopped soon after in 1907. As a secure, already excavated site located 70m below the surface of the Heath, North End made a perfect location for the new control centre, and work on the floodgate control element of the facility was soon completed. The rest of the centre, however, would never be built. As the power of nuclear bombs increased, it became increasingly obvious that an attack on London would leave very little operational, and work on the rest of the facility was quietly abandoned. 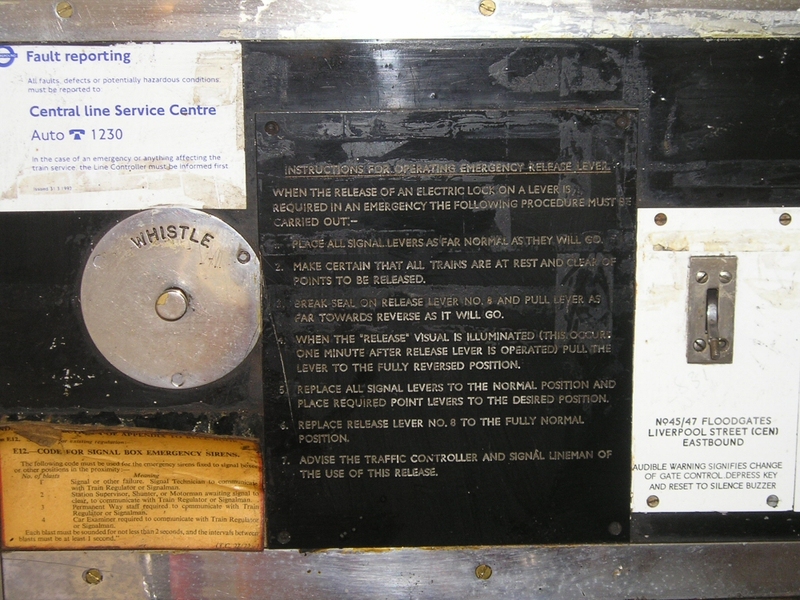 The floodgate control centre, however, was brought into service in 1956, and remained operational until 1984. Today it remains, disused, beneath Hampstead Heath. More information, and some excellent photos, can be found on Subbrit. The fact that the centre is abandoned hints at a truth about the flood defences that remain active on the London Underground today. For though “Oh they have metal floodgates!” would likely be the answer that any general user of the network would give to the question “What stops the Underground from flooding?” today, the simple truth is the the majority, indeed perhaps all, of the floodgates on the Underground are now no longer functional. 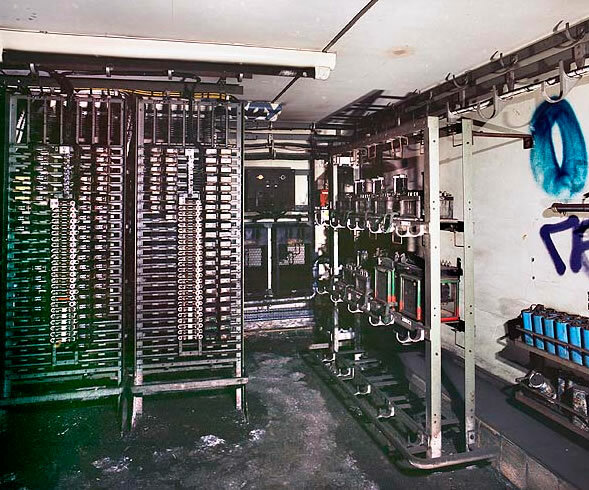 As stations have been improved and signalling systems changed (such as on the Bakerloo Line in the 1980s) one by one the doors have been welded in place, bypassed by wiring or in some places boxed into the platform walls during refurbishment works. On the surface this may seem worrying, but the truth is the gates simply became obsolete. In a nuclear war, the risk of catastrophic flooding due to multiple utility fractures would be the least of London’s problems, and thus updating and maintaining the majority of the floodgates away from the Thames became far less important. Their fate was effectively confirmed when the Brixton extension of the Victoria Line opened in 1971 and became the first section of post-war Line to be built with no floodgates at all. So what floodgates remain today? The truth is that in the post 7/7 world no-one, apart from London Underground themselves, knows for sure. It is tempting to suggest that none of the floodgates remain operational, at least if anecdotal evidence is any guide. If some do, then the likely candidates are those to be found on the Jubilee Line Extension at Canning Town, and those to be found at Tottenham Hale, which is at risk of flooding not from the Thames but from the river Lea. Whatever the truth of the matter, the simple fact is that these days the floodgates on the Underground are more placebo than protection. 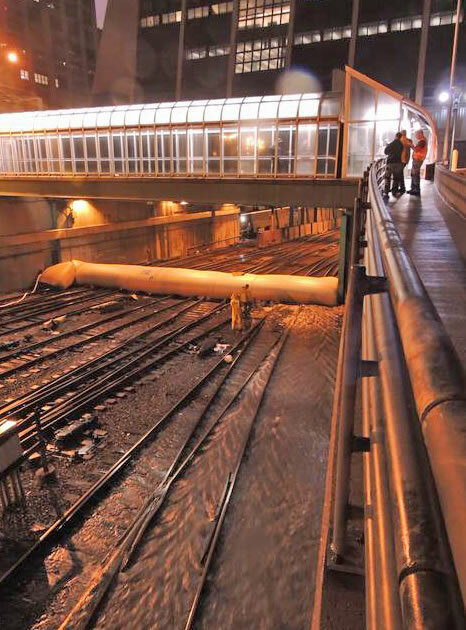 If not in floodgates, then where does the Underground’s real fluvial flood protection lie? The simple answer to that question is hinted at in the year that the flood control centre closed, and in the visual design of the tunnel portal (and floodgates) at Canning Town shown above. 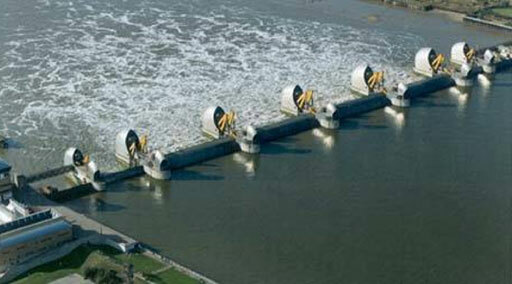 It lies in the Thames Barrier. The Thames Barrier, stretching between Newham and Greenwich, the second largest moveable flood barrier in the world and, quite simply, a masterpiece of British engineering, is the reason why the Underground – and indeed London itself – has almost no risk of suffering the kind of flooding seen in New York. Born, conceptually, in the aftermath of the great North Sea Flood, the Thames Barrier finally opened in 1984, designed to near-as-possible eliminate the risk of tidal flooding within London for the next 100 years. In that regard it has so far been a complete success, with tidal flooding within the capital now largely a thing of the past. It is not a permanent solution, however, and climate change means that its expected effective life is now shorter than originally planned. According to current estimates (as mentioned in the TfL Environment plan and various flood reports by the London Assembly and central government) a new solution will need to be in place by 2070 in order to maintain the same minimal risk levels that exist today. It may not be a problem that the current Mayor needs to be concerned about, therefore, or even the next – but it will need to be addressed, in time. Until then, however, the flooding risks to the Underground remain relatively clear. With the Thames Barrier providing protection downstream, and the risk of a renewed German bombing campaign relatively low in these friendlier times, the risk of serious flood damage to the network is incredibly small. The floodgates may be a comforting thought to some, but they are actually largely unnecessary and likely almost entirely disabled anyway.